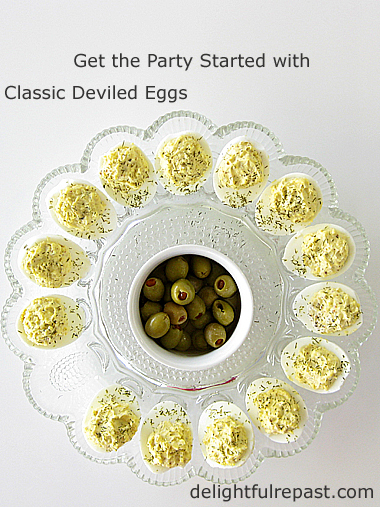 Deviled eggs, or devilled if you're in the UK, are a classic party food. 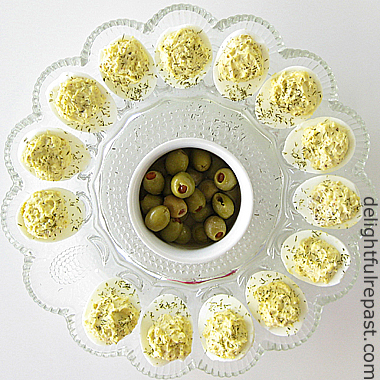 Have you ever been to a barbecue, picnic or potluck that didn't have at least a few batches of deviled eggs? There's a reason for that: everybody loves them! Some people say, it's not a party until you break out the deviled eggs! There are several ways to boil (hard-cook) the eggs, some of which are supposed to be vastly superior to the others; but I'm not even going there, except to say that the best way is whatever works for you. I'm just including one method, in the directions, and leaving it up to you to sort out. I'm only going to comment on the degree of doneness because, well, they need to be actually done. As you may know, I adore Jacques Pepin, but he and I don't see eye to eye on this subject. I say a hard-cooked egg yolk should be yellow and matte, and he says it should be orange and shiny. That's just wrong! Vintage dish is Indiana Glass Company clear Hobnail Egg Plate first made in the 1940s, other colors being added later. 1 Place eggs in a single layer in large pan. Add enough room temperature water to cover eggs completely and an inch or two over. Bring to a boil over high heat. As soon as water is bubbling enough to make even one egg rattle, remove pan from the heat and cover tightly with the lid. Let stand for 14 minutes. Drain and add cold water to pan; repeat twice. Leave eggs to cool for 15 minutes in cold water. Drain, and proceed with recipe or refrigerate until ready to use. 2 Peel the eggs, cut them in half lengthwise and remove the yolks. Place egg whites on a plate and yolks in a 1-quart bowl. 3 With a fork, mash yolks well. Add mayonnaise, mustard and seasonings; mix well. Taste and adjust seasoning. 4 Using a spoon or a pastry bag (Pfft! ), fill the egg halves. Garnish. Chill until serving time. 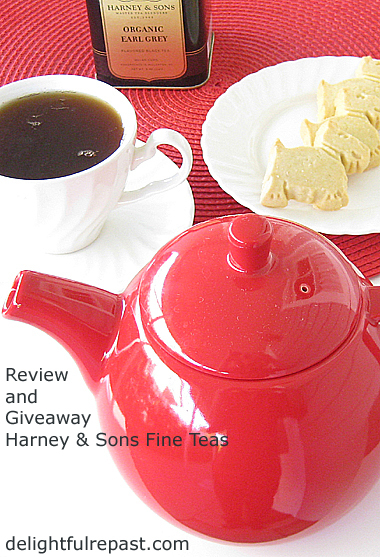 Several years ago I was introduced to Harney and Sons Fine Teas by master tea blender John Harney himself, the founder of the company. I was saddened to learn of his death five years later, but his family is carrying on the fine tea tradition. Wait! Not a tea lover? Don't go away just because you aren't one! Someone you know and love is, and this will make a wonderful gift for that person! Update 04/27/17: Giveaway is now closed. Harney and Sons have white, green, matcha, oolong, black and decaffeinated teas as well as herbal infusions. Since I drink mostly organic teas, I was happy to learn that they currently offer ten organic teas and herbal infusions. 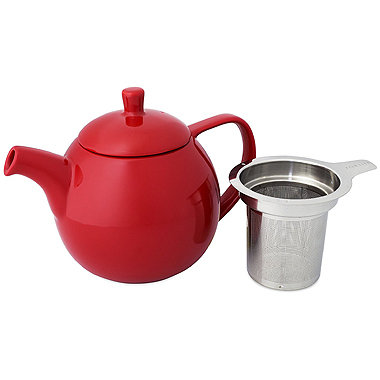 The 24-ounce teapot, which happens to have an excellent non-drip spout, makes up to four teacups or two or three mugs of tea. It comes in six colors: ivy (green), red, blue, white, lime and turquoise. Choose your color! John Harney favored a 5-minute steep for most black teas, as do I, so I went with that for all my tastings. And for each I put 25 fluid ounces of water in the electric kettle (because about an ounce evaporates in the boiling) and 6 grams of loose leaf tea in the fine-mesh stainless steel infuser. In the case of the Earl Grey, 6 grams was 4 1/2 teaspoons (3 scoops with my 1 1/2-teaspoon measuring spoon or 3 "rounded" teaspoons). If you're an Earl Grey fan, you probably know you can get more or less pronounced bergamot flavor by playing around with the amount of tea and/or the steeping time, but I was quite pleased with the balance the first time. I'm going to stop now and move on to the giveaway! I'm sure I've already lost some of you who like to drink tea but not go on and on about it they way I do! 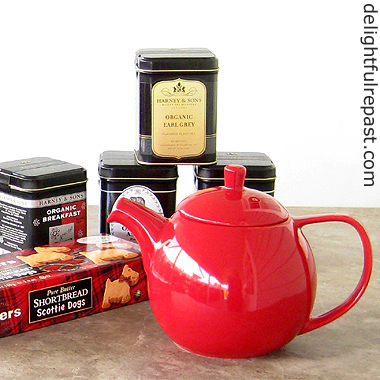 The winner of the giveaway will be sent: a 4-ounce tin Organic Assam, a 4-ounce tin Organic Breakfast, a 4-ounce tin Organic Darjeeling, a 4-ounce tin Organic Earl Grey, a package of Walkers shortbread and a 24-ounce ForLife Curve Teapot with Infuser in your choice of several colors. This giveaway is open to US residents* 18 years of age or older. Leave a comment below (one entry per person); tell me which color teapot you'd like and perhaps your favorite time of day for a nice cup of tea. Please include your email address in the body of your comment. Must enter by 11:59 p.m. Eastern time Wednesday April 26. Winners will be chosen by random drawing and be announced here in the comments before noon Eastern time on Thursday April 27. If I don't hear back from the winner of the random drawing by noon Eastern time Sunday April 30, another drawing will be held and a new winner selected from the original entrants (those who commented before the giveaway deadline). 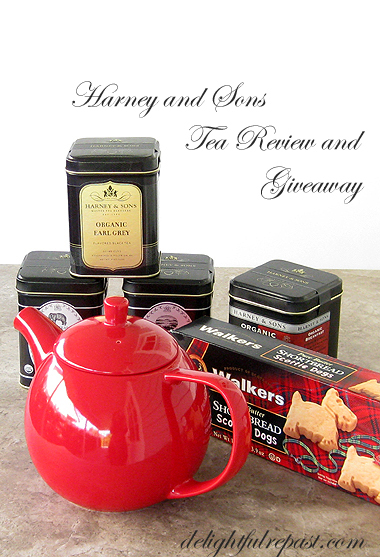 Disclosure: Harney & Sons provided product for review purposes and for the giveaway. The views expressed here are entirely my own. I always tell my readers what I really think! Don't forget to Pin it and share on all your SM! 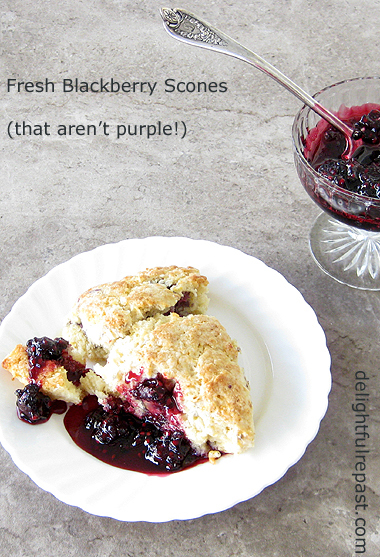 Yes, you can make fresh blackberry scones that aren't purple! I don't make blackberry scones as often as I'd like because I don't often just happen to have fresh blackberries on hand, as I do dried fruits. And frozen blackberries just won't do because I like to cut the berries in half since the whole berries are just too large. But once I've cut the berries in half, I do freeze them for about 30 minutes before mixing them in so that they don't "bleed" all over the dough in an unattractive way. And I cut the scones in a way that leaves no scraps to be rolled out for a messy second cutting. Usually I make 16 much smaller scones from this amount of dough because I'm making them for afternoon tea, an occasion that calls for dainty little things. But these are larger, what I call breakfast-size. 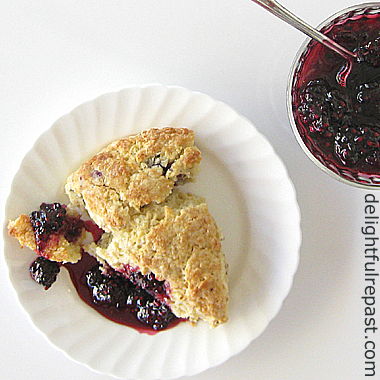 Serve with a bit of blackberry preserve to punch up the berryliciousness! What kind of scones do you like? 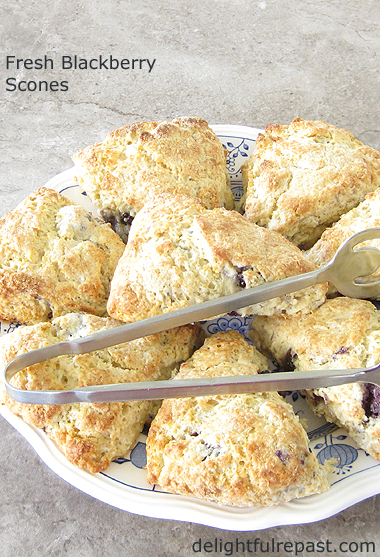 You might also try my Classic Scones, Cream Scones and Fresh Peach Scones. And don't forget the Clotted Cream! PS Be sure to come back next week for a fab giveaway! 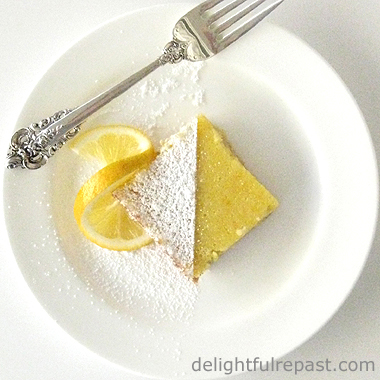 1 Line a baking sheet with parchment and sprinkle an 8-inch circle lightly with flour. Wash and blot dry the firm, fresh blackberries. Cut them in half horizontally and set on parchment-lined quarter sheet pan; place in freezer for 30 minutes. After 15 minutes, preheat oven to 425F/220C/Gas7. 2 In 1-cup glass measure, stir together vinegar and milk; set aside. 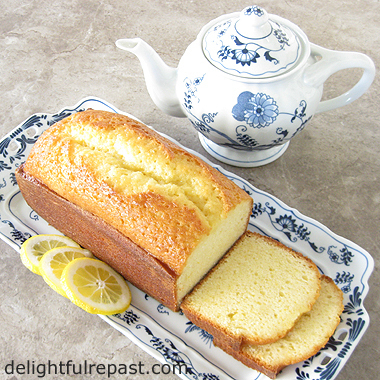 In medium bowl whisk together the flour, sugar, baking powder, baking soda and salt. Cut the butter (or rub it in with your fingers) into the flour mixture until it resembles coarse meal with some larger bits. Stir in zest and berries to coat and separate. 3 Whisk egg and vanilla extract into soured milk; pour into dry mixture and gently mix until just combined. 4 Scrape the dough onto the floured parchment and gently pat the dough, dusting with flour as needed, into a 7- to 7.5-inch round about an inch thick. Cut into 8 wedges. Pull the wedges out (I use a pie server) and space them an inch or two apart. 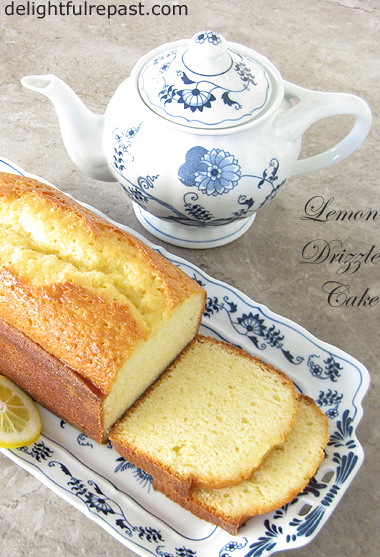 If you like, brush the tops with a bit of cream, milk or melted butter. Bake for about 18 minutes or until golden brown. Now put on the kettle and make a proper cup of tea. Enjoy the delightful repast!